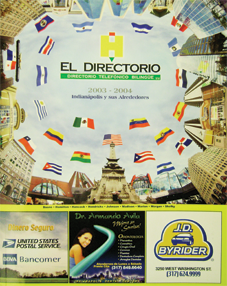 El Directorio is a custom bilingual version of the Yellow Pages. It’s contents supplies information on business in Indianapolis and surounding counties (Boone, Hamilton, Hancock, Hendricks, Johnson, Madison, Marion, Morgan and Shelby). It supplies telephone numbers and addresses from every kinds of business from attorneys and churches to physicians and restaurants.